The football scene in Saline County has many changes this season. Bauxite, Benton, Bryant and Harmony Grove all have new head football coaches, and there’s a new rival game being established in the same vein as the popular Salt Bowl. The two coaches leading the teams of this new rival game – Saline River Showdown – happen to be former coaches at Bryant, where they formed a lifetime friendship. The Salt Bowl, a long-standing tradition between rivals Benton Panthers and Bryant Hornets, attracts around 30,000 people to War Memorial Stadium in Little Rock. Saline River Showdown between smaller schools Bauxite and Harmony Grove will take place at Harmony Grove the night before the Salt Bowl. Coach Paul Calley, the Harmony Grove Cardinals’ new football coach, is Bryant’s most recent former head coach. He imagines the Showdown will have a similar feel to the first Salt Bowl when attendance was considerably smaller at 10,000. 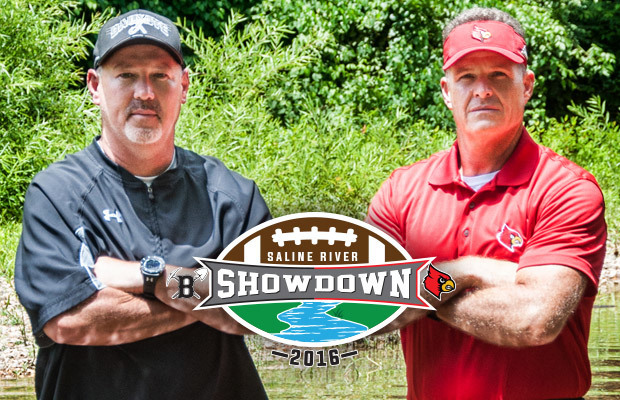 “The Saline River Showdown is going to be a neat atmosphere with everyone rallying around their team. I remember the first Salt Bowl, which was smaller and more intimate, and the energy was amazing,” Calley said. Coaching the Bauxite Miners is new head football coach Daryl Patton, who was the Bryant head coach when Calley joined the Hornets more than 20 years ago. Patton most recently was the head coach at Fayetteville, where he led the Purple Dogs to four Class 7A state titles. After Patton left Bryant in the early 2000s, he helped change the Purple Dogs’ program in Fayetteville to a stronger, more powerful program. “We built a monster and you have to keep that fed,” he said, noting he was ready to step down to a smaller program. Calley started his football career at Bryant and stayed there for 23 years. “Most people start at a smaller school. I did start at the junior high, but it was still a 5A school,” he said. Bryant has grown into a 7A school, the same size as Fayetteville. During Calley’s tenure at Bryant, the Hornets made the playoffs for 13 straight years, and every player who played three years, either shared or won a conference title. The Hornets won 11 out of 13 Salt Bowls under Calley’s leadership, and a personal highlight is that he was Hooton’s Coach of the Year in 2011. It’s been a long time since Calley and Patton experienced football on a smaller scale. Both Bryant and Fayetteville have grown so much, which is a good thing, the coaches said. However, they personally were ready to slow down. “Dealing with 130 kids at Bryant could be overwhelming,” Calley said. “It took a lot of commitment and time, because my job didn’t just stop on the field.” Now he’s in charge of about 50 kids, which is a nice change of pace, he added.